When it comes to picking a flagship smartphone, many consumers choose from one of two options: the latest Samsung Galaxy device or an iPhone. There are excellent alternatives from the likes of Google, OnePlus, LG, Motorola, to name a few, but the two biggest manufacturers remain on top by far in terms of sales. Earlier this year, LG released what it hoped would be a serious premium contender in the LG G6. And while it is a solid, good looking handset, in our review we discussed some of its drawbacks like the inclusion of last year’s Snapdragon SoC, unpolished software, and a camera that is unable to match the best on the market. Even LG admitted the phone didn’t sell as well as expected. But has the company addressed these criticisms in its next high-end device, the LG V30? First impressions suggest that yes, it certainly has. Evan Blass leaked images of the V30 earlier this month that confirmed its tiny bezels and slightly curved front and rear glass, but pictures don’t do the phone justice; this handset is stunning. At 158g and 7.39mm thick, it’s thinner and lighter than the Galaxy S8+, and the curved sides give it a lovely, smooth feel. It screams premium -- I’ve found that even technophobes who aren’t usually impressed by phones have commented on its looks. Unlike the S8+, the LG V30’s fingerprint reader/power button takes a high central position at the rear of the phone, similar to where it’s found on the G6. In my time using it, I found my digit always found the mark first time, and not once did it fail to read my print. LG has talked a lot about the improvement in image quality as it switches from LCD to OLED in the V30. For me, the six-inch, Quad HD+ display (2880 x 1440) is one of the handset’s best elements. The colors look bright and vivid, almost popping off the screen – watching HDR YouTube content on it is breathtaking. I’ve found the contrast between black and white makes reading text so good that I’m now using the V30 instead of my iPad Air 2 to peruse web articles. The phone's screen trounces my Galaxy S7 Edge, and while I only compared the two briefly, I also preferred it to the S8+. The other elements of the display that LG is proud of are the bezels. They’ve been shrunk to the point where the phone boasts an 82 percent screen-to-body ratio, meaning the V30’s physical size is only marginally larger than the G6, making it (just) usable with one hand. 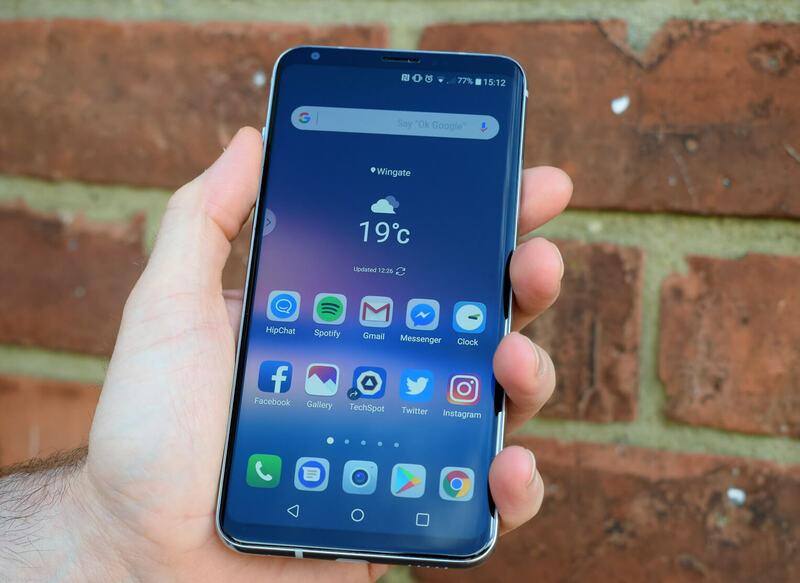 It really does feels as if the screen takes up the entire front of the phone, which improves the overall experience when using certain apps and web browsing. While the LG V30’s RAM remains at 4GB like the G6, LG has upgraded to the same Snapdragon 835 SoC found in most of today’s high-end devices. Not surprisingly, apps load in the blink of an eye and every action feels snappy. There’s also the upgraded UX 6.0+ custom skin interface, which feels more intuitive and looks better than its 5.0+ predecessor. Speaking of software, the V30 has forgone the V line’s famed secondary screen in favor of a “floating bar.” The new addition is essentially a smaller, horizontal version of Samsung’s Edge display tool, allowing quick access to a customizable range of apps, contacts, and programs. When minimized, the bar’s small icon arrow can be placed anywhere around both sides of the screen, or removed altogether by dragging it to the top. I did find it helpful when sending a quick text and adding reminders, but its usefulness will likely depend on each individual user. I personally think it’s a good addition, but do wonder if fans of the V20 will prefer that device’s secondary ticker. As someone who’s managed to smash a flagship smartphone just two weeks after buying it, I was concerned about using the V30 without a protective case. LG claims the Gorilla glass 5 (4 on the rear) and the fact it’s passed “14 different military-standard durability tests” makes it very durable. While I obviously wasn’t keen to fully test its breakability, I did take the V30 to the gym, where it survived a lengthy battering in my pocket as I listened to Spotify through some headphones (hooray for 3.5mm jacks). LG is making a big deal about the V30’s camera, going so far as to call it “market leading.” The f/1.6 aperture camera lens that makes up part of the dual-camera setup is the largest ever in a smartphone, beating even the Galaxy Note 8’s f/1.7. The large size means more light reaches the sensor, which can improve low-light photography. Having taken several photos in low-light conditions, I can attest to this. The images look remarkably clear when captured in dark environments. The main camera consists of a dual 16MP ordinary angle /13MP wide-angle setup that takes excellent pictures. As the handset is still an early review unit (not exact to final shipping phones), I couldn’t make a direct comparison to other phones, but the photos were certainly an improvement over my Galaxy S7 Edge. There’s also a 5MP front snapper that offers selfie-lovers plenty of filters. The V30 comes with a slew customizable software options for video fans. The phone can capture clips up to 4K, and lets wannabe directors use cinematic features such as point zoom and 16 color-grading presets. I found the 3,300 mAh battery still had around 30 - 40 percent power after a day’s heavy use – better than other handsets I’ve tried. And, like most modern flagships, taking V30 into the shower to listen to its impressively loud audio won’t damage it, thanks to its IP68 rating. There was virtually nothing I disliked about the V30. The design does mean it can be slippery, the back is a fingerprint magnet, and some users may never bother with the floating bar, but that really is nitpicking. And after using it for about a week, I still got that “wow” feeling every time the gorgeous display came to life. So, it’s beautiful, sleek, stylish, and powerful, with a great camera and a slew of high-end features. The big question is how it stands up to the best Samsung, Google, and Apple has to offer – the Note 8 has already been hailed as having the best smartphone screen, and comes with a dizzying number of bells and whistles. As mentioned above, this is a preview unit, so a more in-depth review of the final hardware will reveal more, but I do believe the hype surrounding the V30 is warranted. Based on my time using it, this could be the handset that turns LG's mobile division around, especially if it’s more affordable than its chief competitors, namely the expensive Note 8 and upcoming iPhone 8.